This website is about medical waste. It is not about procedural waste in the medical industry - such as wasted time or needless procedures. This site is about physical material waste generated during treatment and other medical procedures. Bandages, blood and stool samples, tissue surgically removed from the body, used needles, cobalt used in radiation treatment, paper that a hospital patient has blown his nose in - these are all medical waste. This site is made for people who have to manage medical waste - people who work at hospitals, medical facilities, funeral homes, veterinary clinics, and wherever waste is produced. You can manage medical waste - keep it from harming your employees, customers, patients, and the general public. You will have to spend some money to do so, but with thought and planning, you can control costs. Medical centers, hospitals and veterinary clinics in the United States generate over 6000 tons of waste every day. Although the majority of this waste is as harmless as common household waste, as much as 10 to 25 percent of this waste poses more serious hazards. Medical wastes can pose danger if exposed to the general public or environment in an untreated form. They also threaten the safety of health care workers, who are considered among the highest risk, especially from infectious waste. The dangers of infectious waste tend to decline over time, and health care workers are nearest the waste generation in both distance and time. Different types of medical waste pose different risks. Engineers, scientists, and industrial hygienists have come up with methods to confine and dispose of medical waste. The design process takes into account the expected nature of the waste; one or more treatments are typically applied before ultimate disposal. Different types of medical waste pose different risks. Engineers, scientists, and industrial hygienists have some up with a variety of methods to process medical waste. The design process takes into account the expected nature of the waste; one or more treatments are typically applied before ultimate disposal. This symbol was developed in the United States by Dow Chemical in the 1960s and is now used worldwide. Like other world hazard signs, it has no words on it. People have to learn what it means. It is widely used so many individuals know it indicates a hazard even if they cannot articulate what sort of hazard. At one time the biohazard symbol was written into US federal law. It no longer is, but some US states have written it into their laws and the symbol finds use worldwide for biohazards, not just for medical waste. What is the difference between medical waste and healthcare waste? There isn't one. The term healthcare waste is also used. Most waste generated at health care facilities is not substantially different, or more harmful, than waste generated at any office building. It includes paper, plastic, and food waste and can be put in the municipal waste stream for landfilling without treatment. This is sometimes called “healthcare general waste” or HCGW. The waste of interest to us on this website is healthcare risk waste (HCRW) - waste from medical facilities that poses a risk to human health and the environment. Some medical waste is called pathological waste and some is "regulated waste". Some is hazardous waste. In the UK the designation Clinical Waste is often used. Other names you may see are red bag waste, bio-medical waste, and bio-hazardous waste. 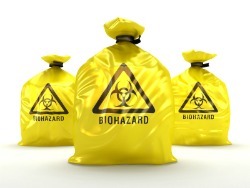 Is medical waste hazardous waste? Not necessarily. We need to say what "hazardous" waste is. Infectious wastes or sharps can be hazardous to people who come into contact with them, but the term hazardous waste in the US is used to refer to waste defined by the Resource Conservation and Recovery Act. Often also called RCRA waste or RCRA hazardous waste, these are generally chemical wastes. They are not radioactive or infectious or liable to cut skin, but there is medical waste that is radioactive or infectious or liable to cut skin and these are hazardous in the commonplace use of the word hazardous. Dangerous medical waste in general is usually called healthcare risk waste or regulated waste. What is the most dangerous type of medical waste? According to the Centers for Disease Control and Prevention, the medical waste that is most risky for disease transmission is microbiological wastes (e.g., cultures and stocks). The most risky for injuries is sharps. Can we treat medical waste and make it less harmful? For the most part, yes. There are different ways to treat the various types of waste and to package it for disposal. This is not a simple thing, though, and specialized treatment facilities are usually employed. Can we recycle medical waste? - It is not feasible to recycle infectious waste. We can recycle non-hazardous waste produced at hospitals - paper waste similar to that produced in any office building. But waste that is infectious, hazardous, pathological, or radioactive cannot normally be recycled. Can we just not produce medical waste? No. We can reduce the amount produced. In many situations a good management plan can cut production of waste and save money on disposal costs. But there is a diminishing return to these efforts. As a practical matter, we are not going to get to a point that there is no medical waste.